This powerful device features 3-Ports with up to 4A Output with BLUETEK Smart Charging Technology. Capable of powering the Apple iPhone, iPad, Samsung Galaxy and many other popular smartphone and tablet devices, the TeckNet PowerTitan identifies and optimises USB power compatibility to enable faster charging and their Patented LED display shows battery capacity to 1% precision and charging rate up to 0.1A precision. The TeckNet PowerTitan also features USB-C compatibility so is compatible with the 2015 MacBook and all the latest generation of mobile devices which it will charge at 5V/3A. 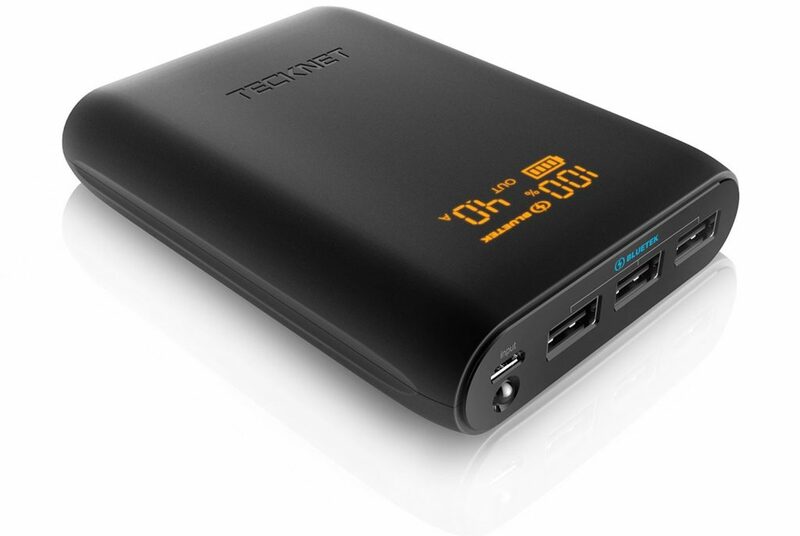 The massive 12800Mah Capacity means the TeckNet PowerTitan can charge the iPhone 6 five times, the Samsung Galaxy S4 four times, and over one full charge for the Apple iPad Mini. The BLUETEK Smart Charging Technology identifies your mobile device to automatically deliver the fastest and safest possible charging rate up to 4 amps per port and the device is capable of pass-through charging (or Duo-Charge) which allows you to charge the PowerTitan while it is also recharging a connected device. This device will fully recharge mobile phones such as the Samsung S2, Nexus 7 and Motorola Moto G 2nd Gen in less than 3 hours. Plus the unit itself recharges in around 6-7 hours using a 2 amp adapter or the included Micro USB charging cable. On the downside, all this power and capability comes at a cost, this unit is heavy, it weighs 285g so you will definitely know about it if you carry this in your pocket! However, if you want the capability to charge 3 devices at once using the latest smart charging technology, then the TeckNet PowerTitan should still be on your shortlist and costs around Â£16 from leading online retailers.